Do you enjoy Mexican cuisine and like to cook? Does your mouth water at the prospect of a vibrant salsa verde, a tortilla fresh off the griddle, or a subtly flavored mole? 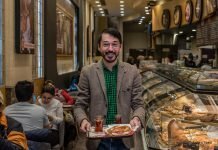 Do you favor traditional culinary methods? If, as for me, your answer is a resounding “yes” to all of the above, you will appreciate the talents of Maria Laura Ricaud of San Miguel de Allende, Mexico. 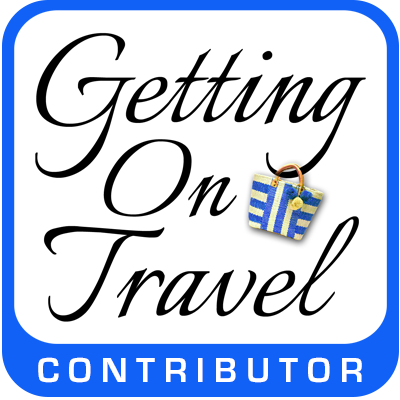 Update August 27, 2013 – My contribution to Marcia Mayne’s “Foodie Tuesday” series on Inside Journeys. 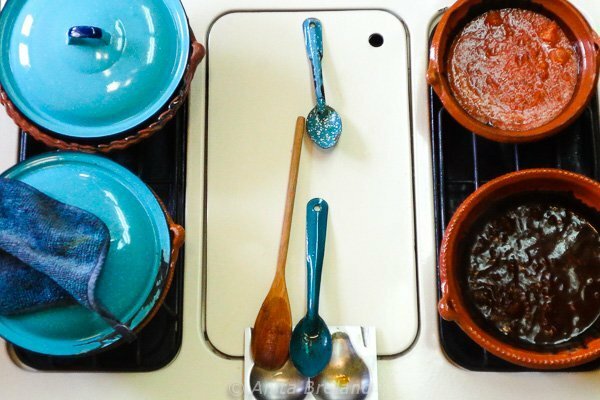 Last month, I had the pleasure of not one, but three sessions in the kitchen of Marilau Mexican Ancestry Cooking School, learning the basics of Mexican cuisine in a kitchen delightfully reminiscent of my grandmother’s. 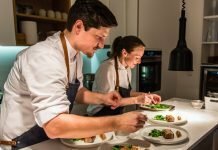 I came away with new techniques to try at home, as well as greatly enhanced food memories of my visit to San Miguel. A traditional Mexican salsa is a sauce in the French sense of the word: smooth and richly flavored. Our first session was devoted to salsas. Not chip-and-dip salsa, mind you, but richly flavored, slow-cooked sauces based on fresh or roasted chilis. These sauces—all six (!) of them—tasted divine as dressings for simple taquitos. Marilau’s gift was to show me how each could be enhanced, or in a couple of cases, combined, to elevate the magic. She also gave me a lesson in chili nomenclature: I never knew that jalapenos become chipotles when dried and smoked, as many times as I’ve eaten them. Anyway, I now have a whole kit-bag of salsa preparations; I just have to source the chilies. Dried chilies, toasted, soaked, de-veined and seeded, are the basis for great Mexican salsas. 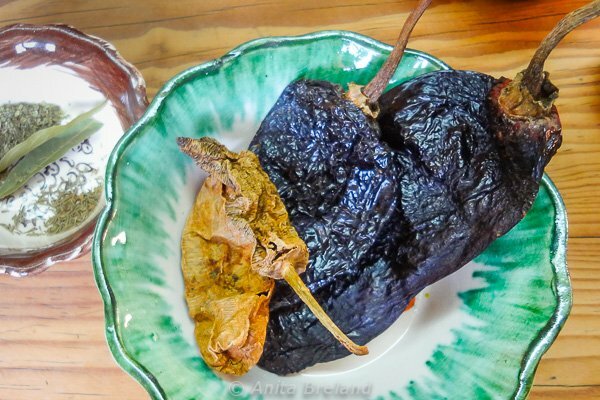 Dried chilies such as these can be combined in a sauce, augmented with herbs and roasted garlic for added impact. 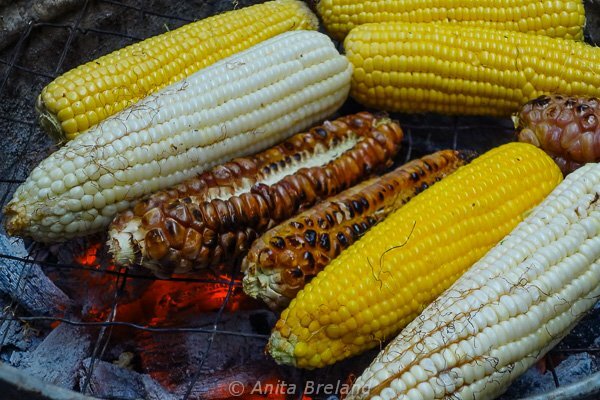 Corn is a Mexican culinary staple, wonderful as a snack: grilled over coals, kernels stripped and tossed in chili powder and lime juice. On our second day together, Marilau taught me how to make corn tortillas—integral to Mexican cuisine, and a long-timed favorite of mine—three ways. Two of the methods involve masa harina, but the first, most authentic, way to mash up dough for tortillas, involves a product used by Mexican cooks—and almost unheard-of elsewhere: Nixtamal. 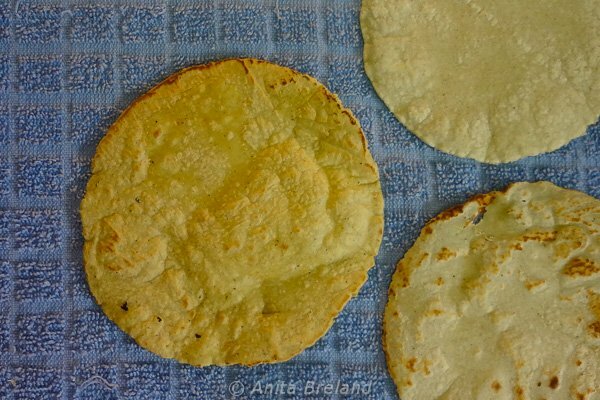 This water-and-lime mixture for removing the skin from corn kernels produces evenly cooked, flexible tortillas that scream “corn” (Nixtamalization increases the nutritional value of tortillas, as well). Since I am unlikely to score a sack of Nixtamal, or make it myself, Marilau made sure I learned the properties of the other two methods. Tortillas made of masa and water alone taste most authentic, but break easily when folded; those made with the addition of wheat flour are not as “corny”, but are easier to fold for dishes such as enchiladas. 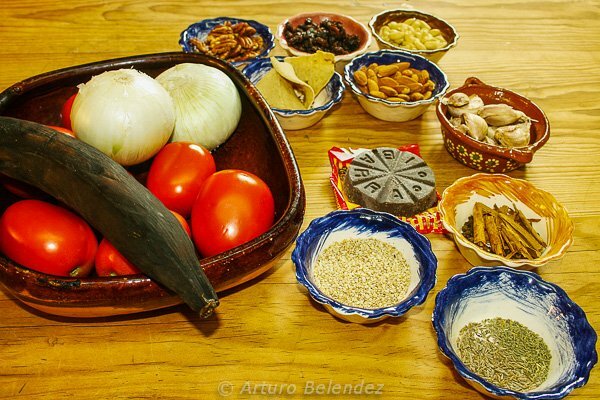 The most complex salsas in Mexican cuisine are moles, following recipes developed in the convents of Puebla. They contain many ingredients, with the most famous “exotic” ingredient often—but not always—being chocolate. Moles are time-consuming to prepare, put together in a prescribed order, and complex in flavor. Until my day with Marilau, I had never appreciated moles, often finding them too heavy in a restaurant meal. When she topped a piece of poached chicken with the mole we made and a garnish of slivered onion, though, I changed my tune. I am now an official missionary for the goodness of mole! As a sidebar to our mole session, I also learned to deep-fry (yes!) long-grained rice according to Mexican tradition, and was surprised at the texture and flavor this produced. 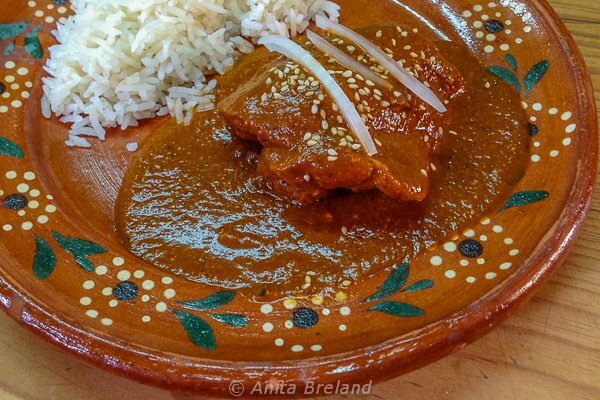 Mole invokes not only the flavors of dried chilies, but also the character of a number of other ingredients. Roasted tomatoes, plantains, onions and garlic provide depth of flavor, pieces of tortilla add body, and Mexican chocolate, nuts, dried fruit and spices guarantee complexity. 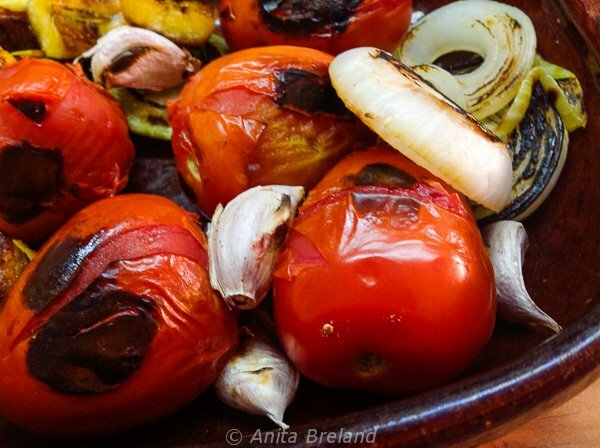 Pan-roasted onions, tomatoes, garlic and plantains…next top, mole magic! Skip the plantains, and you have the makings for a variety of salsas. 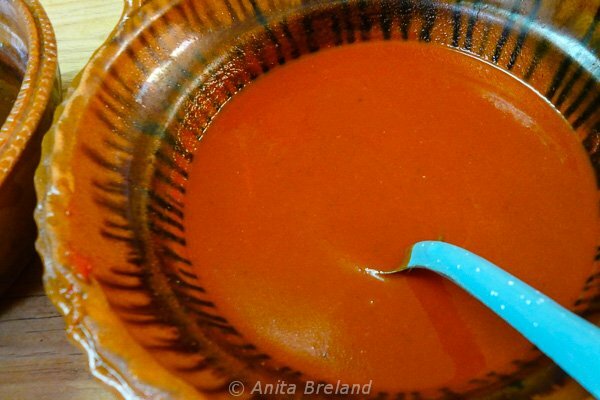 Moles can look deceptively simple, but these complex sauces pack a wallop of flavor. 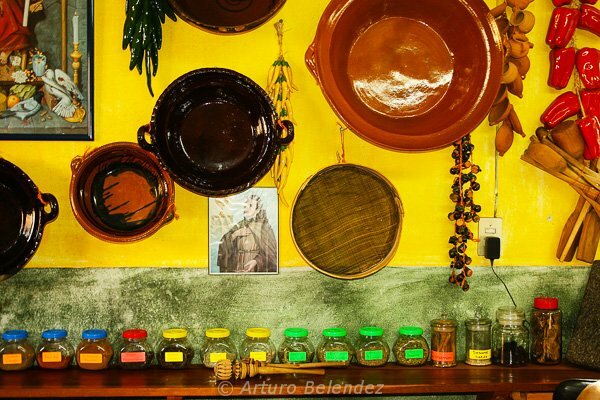 The walls of Marilau’s homey teaching kitchen are hung with brass pots and terracotta cazuelas used in her family for generations . It was a flavor-filled leap from the Tex-Mex platters of my university days to the diverse regional cuisines in Mexico, when I lived there a few years later. 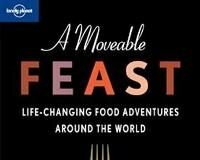 Over time, and learning from cookbooks, such as Diana Kennedy’s ground-breaking Cuisines of Mexico, and the works of Rick Bayless, I have enjoyed exploring the richness of Mexican cooking. In 2010, traditional Mexican cuisine was inscribed on Unesco’s Representative List of the Intangible Cultural Heritage of Humanity. Thanks to Marilau, who is on a mission to share the time-honored traditions of her Mexican culinary traditions, I now have an enhanced appreciation of the ingredients and techniques involved. A day in the Marilau kitchen is filled with laughter as well as learning. Do you share my interest in learning more about its subtleties and origins? 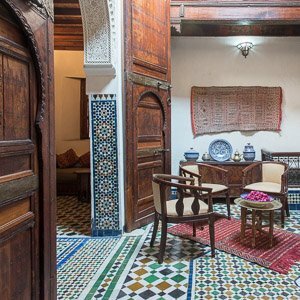 If you find yourself anywhere near San Miguel de Allende, Mexico, consider joining a lively class in the Marilau’s home-style kitchen. She will happily tailor sessions to the interests and expertise levels of participants. 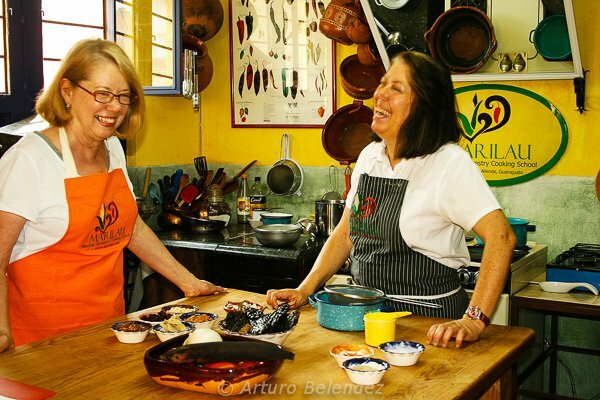 Thanks to Marilau Ricaud for graciously sharing the kitchen of Marilau Mexican Ancestry Cooking School with me for three fun-filled days, and to her husband, Arturo Belendez, for wielding his camera while we chopped and stirred. Oh, Anita, my mouth is watering. I LOVE, LOVE, LOVE Mexican food! It must have been such a treat to learn from Marilau, and to share with us a little of what you learned. I didn’t know, for example, that you could use plantains in the mole or that lime and water can remove the skin from kernels of corn. I’ll have to try that one day. 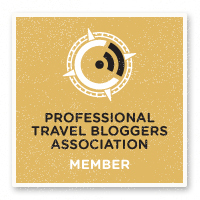 Thanks for linking up this week, Anita. Hope you enjoy the rest of it. Yes! I’m really not much of a cook myself, but if Maria would take me under her wing, I’d love to give these dishes a try. Everything looks delicious. The first time (years ago) that I had mole on enchiladas in a restaurant, I wasn’t so sure I liked it, but since then my tastebuds say “more”! Exactly my reaction! I was amazed that mole turns out to be so complex, tasty, and ultimately, sublime.